We weren’t allowed any games that simulated shooting. My dad hated any play that had to do with guns. We didn’t have a TV so we didn’t know the “TV cowboy” genre. I do remember making bows and arrows out of branches and sticks, including attaching arrowhead-shaped stones to the sticks with strings or rubber bands. My father also often found (well, maybe five or six times) real arrowheads as he was working his northern Indiana farm. It always kind of thrilled him and we saved those stones. At the time I had no idea that meant our farm was probably a location where Native Americans had lived, nor had I put together why they may have moved on. A distant cousin, Ervin Stutzman has completed a novel trilogy about a common ancestor, Jacob Hochstetler, regarding what might have happened to Jacob and two of his sons, Joseph and Christian. All three were captured by natives during the French and Indian war in the 1700s in a raid and massacre in the Northkill area of Pennsylvania. Jacob’s wife and two of his other children were brutally killed. The books are titled Jacob’s Choice, Joseph’s Dilemma, and Christian’s Hope, all published by Herald Press. 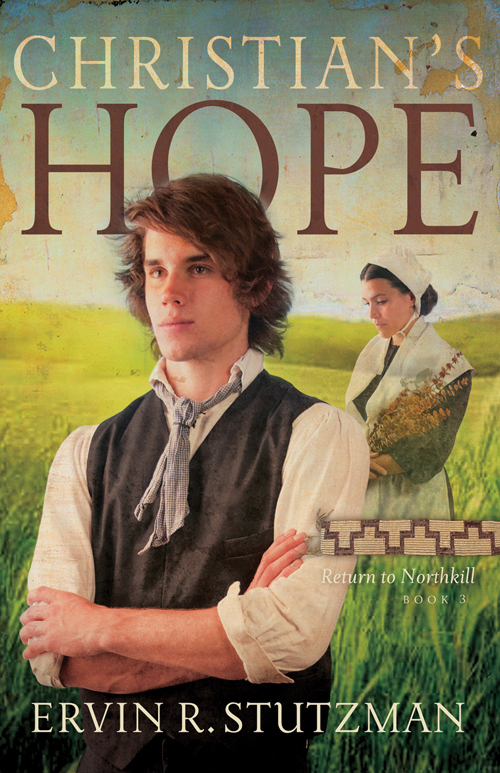 I have now finished reading the third volume, Christian’s Hope, and it especially takes us inside the mind of what it might have been like to live and think like a native in those days. Young Christian lived for about seven years as a native with the Shawnee tribe, adopted by a family he came to love. But after treaties were signed, he is forced to return to his home and while he was interested in seeing his father and family, he is depicted as having an extremely difficult time adjusting to life back in his Amish community. He chooses to retain the dress and hairstyle of the Shawnees. The small wigwam he built for himself is burned down. The hatred and misunderstanding he senses, sees and hears from white settlers is so strong at some points he fears for his life. Ervin is by now a prolific writer along with being a seasoned church leader, getting ready to retire from his recent years at the helm of Mennonite Church USA as executive director. In this third novel, underlying his well-developed plot, Ervin drives home the point that Native Americans were repeatedly moved westward to accommodate incoming settlers from Europe—in some cases political or religious refugees. The settlers were farmers rather than hunter-gatherers, so they desired land. Possessing their own land was a concept totally foreign to natives who believed all land belonged only to the Creator. Many of us today live on land occupied originally by natives who were pushed to poorer land. The second and third volumes in Ervin’s trilogy set out to help all of us understand a bit better both the lives and values of Native Americans (in Canada often called First Nations peoples). It is well worth the read to absorb some of the insights Ervin found through extensive research into native religious faith, customs, and history. Many of us born in North America have indigenous peoples ancestry from many different family trees. While some are inclined to want to forget the terrible deals, fighting, injustice, and sacrifices, the more we understand about the past can help us truly appreciate what others have went through before us. What the often troubled young man Christian eventually became in this novelist’s imagining, and what researchers know from records regarding what actually happened in his life, weaves a hopeful and rewarding tale. What do you know of your heritage? How important is it to you? For more on the three novels go to store.mennomedia.org or call 800-245-7894. Another Way is a column by Melodie Davis, in syndication since 1987. She is the author of nine books, most recently Whatever Happened to Dinner. Another Way columns are posted at FindingHarmonyBlog.com a week after newspaper publication.